Coconut Oil: Pure and Healthy? Or Purely Hype? Do you love coconut oil? Chances are that you have heard that this natural oil is capable of doing almost everything. With so many claims, one has to wonder – is this the real fountain of youth? Or just another “snake oil”? A quick Google search about coconut oil will reveal more than 29.4 million hits, most of them touting almost miraculous claims about how this oil, more so than any other, can do just about anything. Whether you want to lose weight, improve your memory, improve your hair, clear up your skin, prevent sunburn, or even improve the overall health of your heart, it appears that there is nothing that this oil cannot do. While dozens of celebrities and celebrity doctors can be seen on television shows and internet programs talking about the benefits of coconut oil, this oil has actually been on the list of unhealthy fats for many years due to its high level of saturated fat. Before you head out to your all natural, organic food store and stock up on this popular item, let’s take a close look at the research related facts regarding coconut oil. 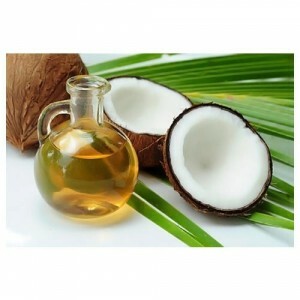 Coconut oil is made when the white meaty part of the coconut is put through a high pressured type of press. Although you will find dozens of sites telling you how great coconut oil is, the truth is that there is no real evidence that coconut oil can do most of the things that people say it can. Like all other fats, coconut oil has 9 calories per gram, which makes this a calorie-dense food. Dietary fat from all sources should be limited to no more than 35% of your daily caloric intake. Probably one of the most important facts you should remember about coconut oil is that about 90% of it is made up of saturated fat. Trusted health experts recommend that you get no more than 10% of your caloric intake from saturated fat. If you have heart disease or if you have a greater risk of developing heart disease, your limit should be no more than 7%. This is confusing to many people because while some experts are stating that you should greatly limit your consumption of saturated fats, other “experts” are saying that not all saturated fats are equal. How do you decide who is telling the truth? Let’s take a look at short chain, medium chain, and long chain fatty acids. When humans consume plant or animal fats, we are consuming fatty acids. Fatty acids differ in their make-up in that animal fats have longer carbon chains than plant fats. For example, while butter and milk have very short chains of no more than 4 to 6 carbons, peanut oil has 20-22 carbons. Coconut oil is what many people refer to as a “medium chain” fatty acid with between 12 and 14 carbons. It is true that fats with medium length chains (often referred to as medium chain triglycerides or MCT for short) are metabolized differently by the body than longer or shorter chains. MCT’s are sent directly from your intestines to the liver, where they are much more likely to be burned as fuel. Longer and shorter chains will often be stored as fat unless your body needs them right away. It’s precisely this fact about MCT’s that lead people to the conclusion that coconut oil must cause you to lose weight. Although this might make sense, if this was the only puzzle piece you were aware of, however, no source of food is a pure source of any single type of fat. For example, olive oil, often called the “heart healthy” oil because it contains monounsaturated fats, does also contain saturated fats, just smaller amounts. Most foods are a blend of all three types of fats; short, medium, and long chain. The only way to get pure MCT’s is through processing, such as for scientific research. Research done with humans shows that when processed or distilled coconut oil is used in place of fish oil or vegetable oil, it can result in a short term increase in the metabolic rate of the body as well as increased feelings of satiety. However, since the oil used is these studies is a highly processed oil of pure MCT’s, it would be a mistake to say that the coconut oil you buy at your store and the ones used in these studies is the same and will therefore produce the same results. By the way, coconut oil’s main fatty acid is called lauric acid, the same type found in dairy products. This type of fatty acid has been shown to greatly increase the bad (LDL) type of cholesterol in humans. LDL cholesterol is the kind that ends up forming plaque that blocks the arteries to your heart and brain. You might have read some studies which found that coconut oil also raised the good (HDL) type of cholesterol in the body, but this certainly doesn’t mean that coconut oil is good for your heart, only that it might be, but this has yet to be proven. In fact, one study done in 2015 at Harvard found that replacing calories from refined carbs, such as bread, and swapping them for calories from saturated fats, such as butter and coconut oil, did not lower the risk of heart disease. Isn’t Saturated Fat Supposed to Be Not as Harmful as Previously Believed? The science of nutrition is constantly evolving, research and knowledge are always growing and changing. This increase in knowledge has some people questioning what we originally believed about saturated fats. You can find many websites claiming that saturated fats are not nearly as bad for your heart as previously believed. What we do know is that different types of saturated fats affect the body differently and that coconut oil is different that the types of fats found in meat or diary products, however, this does not mean that coconut oil is necessarily good for the heart. A few studies have shown that some types of saturated fats might lower the risk of heart disease, while at the same time, other studies have shown the opposite to be true. Sites that state, coconut oil is good for the heart are only showing you the studies that prove the point they wish to make and are not telling you the entire truth. Until we know for certain what the risks are, don’t make what might be a fatal mistake and eat coconut oil to your heart’s content. What About Studies Showing Certain Populations are Healthy, Despite Consuming High Quantities of Coconut Oil? The study that most people are talking about is one that was done many years ago on the Pukapuka Islands and Tokelau Polynesian Islands. This study found that, although the consumption of coconut and coconut oil was quite high (as much as 63% of total calories consumed), heart disease was very rare, even though the Islander’s blood cholesterol levels were very high. What you aren’t being told about this study, however, is that this entire claim was based on one ECG test, not autopsy results, not on the cause of death of the island population. Although an ECG can tell us many things about a person’s heart, it is not considered to be a reliable means of assessing overall cardiovascular health. It’s important to note that, while these Islander’s consumed large amounts of coconut, they consumed little or no sugar, salt, or other types of cholesterol. They also ate a diet high in fish and fiber, maintained a very active lifestyle and used very little tobacco and alcohol. So while this study is often talked about when touting the benefits of coconut oil, it was extremely limited in its scope and application. Keep in mind that correlation does not always mean causation. This means that there is simply no way that an uncontrolled study, such as this one, should attribute that it was coconut oil and coconut foods which contributed to their lack of heart disease, which was never really proven to begin with. Can’t Coconut Oil Help with Alzheimer’s or Memory Problems? While coconut oil definitely does contain antioxidants, which will absolutely help the body fight disease, you can get a whole lot more antioxidant bang for your caloric buck by eating vegetables, whole grains, and fruit. The idea behind the Alzheimer’s statement is that coconut oil provides an alternate, or preferred, source of energy for the brain. Unfortunately, this information comes from a personal experiment conducted by a woman whose husband had Alzheimer’s and not any scientific evidence. Alzheimer’s disease can wax and wane, with those affected having good days and bad days. Sometimes, coconut oil has the placebo effect on the family, who want desperately to believe that this natural substance is helping their loved one. We want to be clear that this doesn’t mean that coconut oil is ineffective or that it doesn’t work for those afflicted by Alzheimer’s; only that, as of today’s writing, there is no scientific evidence that it does work. According to The Alzheimer’s Society, there is a clinical trial currently underway in the US which might provide us with some definitive answers. The results of this study are expected to be announced sometime in mid-2017. Does Coconut Oil Work Just as Well as Commercial Sunscreens? No, this is absolutely not true. No one seems quite sure where this myth comes from but believing that coconut oil can protect your skin from the harmful rays of the sun every bit as well as sunscreen could be a deadly mistake. Coconut oil has a natural SPF of about 8. That’s it. While we understand some of the concerns regarding ingredients such as retinyl palminate and oxybenzone, which are commonly found in sunscreen and might actually pose some health risks, resorting to using only pure coconut oil would be a serious mistake. If you would like to know how to choose the best possible sunscreen, head on over to The Environmental Working Group page. You can find their list of tips for picking out sunscreen here. This article was not meant to dissuade you from enjoying coconut oil, only that you should limit how much you consume until all the facts are known. Remember that there are currently no credible studies yet proving that coconut oil can do anything more than give you some nice hair and skin conditioning. Use coconut oil as a condiment, rather than your everyday oil for cooking or baking. A little bit goes a long way, but if you enjoy the flavor and texture, there is no reason why you can’t enjoy coconut oil, as long as you keep your consumption of saturated fats within what is considered to be the healthy range. Like many things in life, you will find that moderation is the key. Too much water will drown you and too much sun will burn you, but without these things, life would not be possible. Even if coconut oil were found to have super health benefits, such as water does, you still would not want to consume cups of it every day. Keep your life, including your diet, in balance, and you will find that everything works together in harmony. up and operating as quickly as attainable.